Has anyone read Alex Haley’s novel Roots: The Saga of an American Family or seen the TV mini-series based on the book? In the seventies, both the book and the TV series were a huge success. Roots sold over one million copies in its first year and won both the National Book Award and the Pulitzer Prize. The mini-series was watched by 130 million people. In case you wouldn’t know, Roots tells the dramatized story of slavery in The Gambia. It follows author Alex Haley’s family line, starting with his famous ancestor Kunta Kinteh’s enslavement in 1767 to his descendants’ liberation. Last week, I did an excursion in The Gambia which was entirely dedicated to Kunta Kinteh and his life as it was portrayed in Roots. In the morning, we took a small cruise ship from Banjul to the North bank of the Gambia River. We first disembarked on Kunta Kinteh Island, formerly known as St. Andrew’s Island (named after a Portuguese sailor who died there of malaria). This used to be the last bit of African soil that many slaves saw before being transported in ships to the Americas. Before exploring the ruins of this UNESCO World Heritage site, our guide told us about its history, about how the Germans built the fortifications, and how the island becomes smaller due to erosion and might be gone one hundred years from now. He also told us stories about slavery in connection with Kunta Kinteh Island. We learned that prisoners were given mandatory names and that the slave trackers raped female slaves so that their children could serve them as well. The women then strangled their own babies to protect them from misery. 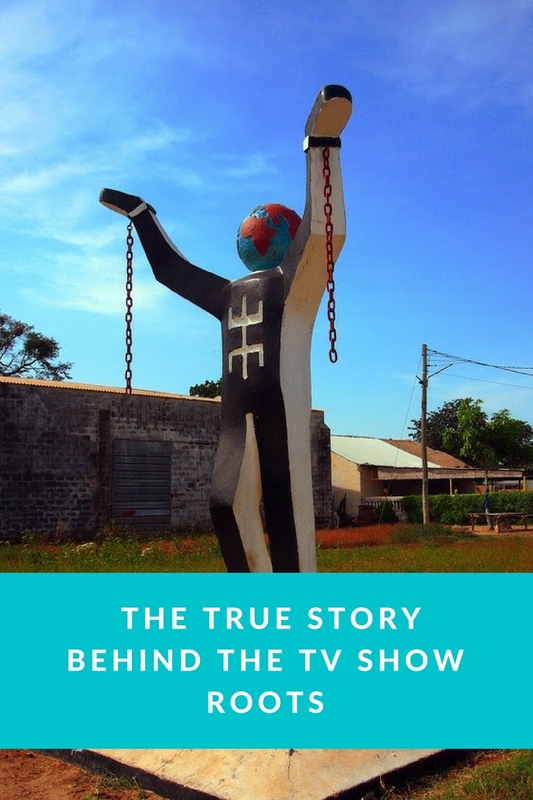 What makes Kunta Kinteh’s story unique is that he fought to preserve his cultural heritage (like refusing to take the English name that the slave drivers gave him). Kunta Kinteh Island is now uninhabited apart from a large colony of Golden Silk Spiders. Next, we left by boat to go to Albreda and Juffureh. As soon as we disembarked in Albreda, we were welcomed by a group of waving children and women who performed little tricks while crushing herbs. Poverty reigns in the village. A steady income is as good as non-existent and the inhabitants largely depend on small donations from passing tourists. Many of the villagers begged for money and were unwilling to take no for an answer. Most of them, however, just sat around talking and putting vegetables from one basket into another, while their dogs and goats slept next to them, numbed by the heat. Life is slow in Albreda. Our first stop was the Albreda Slavery Museum, which mainly consisted of drawings, pictures, and informational panels. Outside the museum is an exact replica of a slave ship. The museum wasn’t anything special, but I think it’s worth visiting the area as it’s one of the poorest parts of The Gambia and really opens your eyes on poverty and different ways of life. We then walked to Kunta Kinteh’s home village Juffereh. Once more, we were struck by the poverty of the place. Juffureh may be a historically important community with a famous ancestor, but life is not treating the people well here. The begging, which now involved tugging at our clothes, made us feel uncomfortable. In Juffureh, we also met one of Kunta Kinteh’s descendants. She offered a certificate for sale as proof of our visit. After the Roots Experience Tour, we thought the day’s adventure would be over. Actually, it had only just started. While we were heading back to the south bank our boat’s motor broke down in the middle of the river. We had to be rescued. That meant waiting for a little canoe to row us to the mainland. Back to where we started, we waited for a bus to pick us up at the entrance of Albreda. 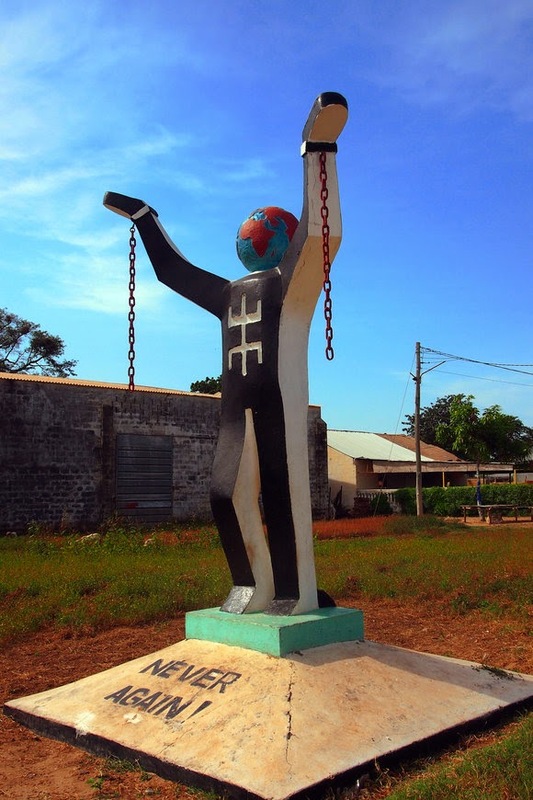 It was here that we learned that time in The Gambia had an entirely different meaning. Everything in The Gambia lasts twenty minutes, even if it’s two hours or forty minutes. "That’s how the term GMT was invented," our cruise coordinator joked. "You mean Greenwich Mean Time?" "Here it means Gambia Maybe Time. You can never be sure when someone or something will arrive." After about an hour, a ramshackle little bus took us for an hour and a half drive to the ferry port. During the trip, one of my fellow travelers wanted to open the window but accidentally took out the glass instead. The air smelled of fresh herbs. The ferry was a different story. I felt as if we were being transported inside a garbage container. The passengers were mainly locals. Some had their goats on a leash; some carried a coffin. An authentic experience, to say the least. Back on shore, we immediately went to Poco Loco to enjoy our evening meals. There was singing on stage and the atmosphere was jolly. The crowd consisted mainly of white, older ladies and their young, black lovers. It was yet another part of this country - the part in which fun, comfort, and money took center stage. A small ginger cat found its way inside and perched itself on my lap - one of the many starving inhabitants of The Gambia. Disclaimer: The Roots cruise was sponsored by The Gambia Tourism Board, Bamboo Garden Hotel, and SN Brussels Airlines. The opinions are my own. And sad that those people live in such poverty. Sometimes we just can't fathom that level of poverty. I remember watching Roots when it premiered - I was 10 or 11 at the time I think and it made a huge impression on me. How interesting to see all of this now. The poverty is so heartbreaking and it really is impossible to imagine. It always bothers me to find there are so many poor people in this world, its really so sad. The sunset photos are beautiful! It's hard to imagine what it's like to live in such poverty. I enjoyed reading about your trip, and seeing the photos. I really like the one with the woman wearing the shawl. It looks like something you'd see in a National Geographic magazine. Bedankt voor bezoek op mijn blog, en je reactie. Ik zie dat je Nederlands kent, dat maakt het voor mij wel iets makkelijker. Jou site ziet er prachtig en verzorgd uit, een stuk leersplezier voor velen. This is absolutely beautiful. 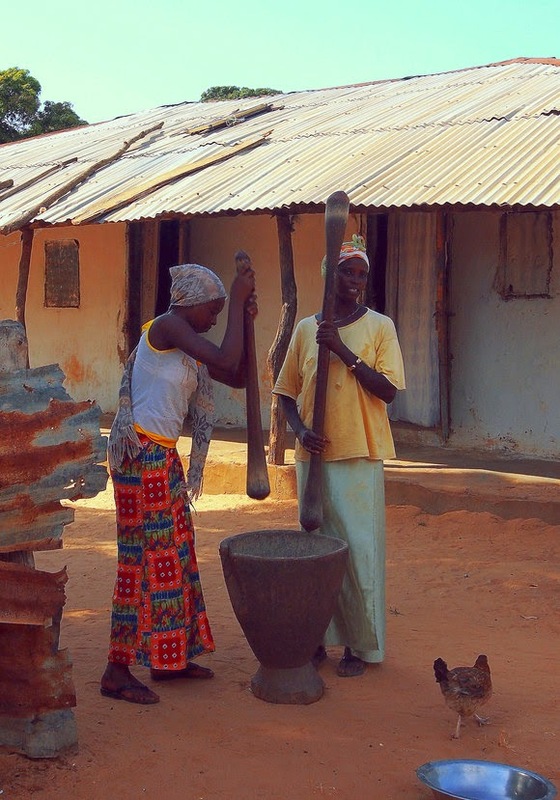 Looking at your photos makes me want to go exploring and see wonderful experiences Gambia has to offer. Beautiful photos!! Can't even imagine living that way, but sadly a lot of the world does indeed. Wow. Thank you for sharing this. I feel so sorry for people living in such poverty. I'm sure this was an incredible and eye-opening experience. The pictures are stunning, too. What a place! 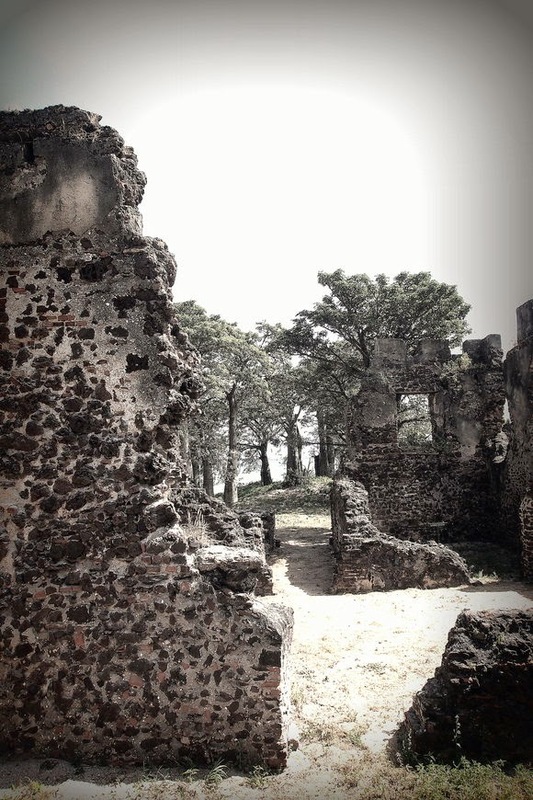 Those ruins are amazing... too bad they are riddled with spiders... EEK! Love the faces of the people there. Their faces will stick with me for some time. What amazing pictures from such a heartrending place. Thank you so much for sharing--this was fascinating! I've never read Roots, but I've always wanted to. I have seen the TV series, though. 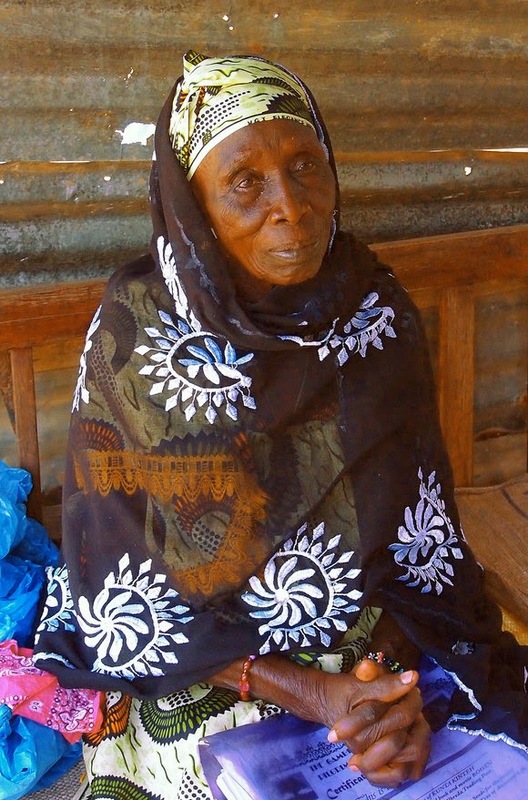 Going to The Gambia would be memorable, haunting, and heartbreaking. The pictures you shared are amazing! Wow. Can I just say what an amazing journey that must have been! Beautiful photos and my heart just hurts thinking about slavery and the human races' ability to be so cold and cruel. Though I am not naive as to think that the world rains love and sunshine, I am well aware of our capacity to express the very opposite end of that spectrum. Thanks for sharing! Knap hoe je het leven en de omgeving weer geeft. Het zijn beklijvende beelden. I followed the TV series and I may have read the book, I cannot really remember, too long ago. I love the way you report about your experience. Must have been great, even with the discomforts and the break down. I'd have trouble with the begging, though, especially when they start to pull your clothes. I should see about getting hold of one of your novels. I'm currently reading Wolf Hall, but not progressing very well. I have not read the book. Now am curious reading this post. will try find it in my local bookstore. Je ziet het dat jij op het vlak van de media goed beslagen bent. Zowel de tekst als de foto's maken van deze reportage iets héél bijzonders, dank je om dit te delen! OT: leuk dat jij ook Tiki-fan bent! Love all of those photos? Why does it seem like I've heard of Kunta Kinteh? I didn't mean to put a question mark on the first sentence. I mean to put an ! What a neat experience! I would love to visit places like that one day. I have never read the book, but the movie is one of my favorites. Thank you for sharing your trek! That place is eerie with memories. Now I know where Kunta Kinteh is. That 'Never Again' statue is amazing. Thanks for sharing. Very interesting. As for "Roots," I read the book and saw the mini-series as well in the 70s. What blockbusters both were! I think I read somewhere online that they are remaking the mini-series now. Wonder if that's true. The little ginger cat knew a friend when it saw one. What a humbling experience--I've traveled outside the United States to poorer countries and I always return grateful of the things that I have and the opportunities that I've been given. I can remember seeing bits and pieces of Roots when I was little, and it mesmerized me. While what happened to the people of Gambia was horrific, I am glad that there are reminders there for all of us so that we can continue to fight against oppression and injustice! What an amazing experience. I've never traveled out of the US except for Mexico, but think it would be amazing to someday. Wow, your description is so raw, I feel like I've started reading the book over again. Such an amazing journey for you to go on, one that you'll never forget...thank you for sharing! This is a lovely post. Thank you. What an amazing experience. That statue is powerful. Love the Gambia (sounds like my country Zambia - in name only) always have with its history being at the heart of it, its sad state of affairs that poverty has it at. Thanks for sharing your adventures and sharing your thoughts on Gambia. I've never read roots before, but I bet this was an incredible learning experience. When we went to Haiti, we experienced a lot of begging too, and it's become a way of life. Such a different world you visited - and while things aren't so prosperous for the people there, I'm glad slavery is no more for them. I remember watching Roots in high school. I still consider it to be one of the best mini-series of all time. How interesting to visit where Kunta Kinteh grew up. It must have been incredibly sad to be surrounded by so many people who didn't know where there next meal was coming from. You captured some amazing photos, and seemed to make the most out of this difficult journey. What a heart wrenching experience, but I'm sure you learned a lot. I remember watching that movie in high school and being so upset by it. Gorgeous photos. What an experience. What a great post! I spent a few months in Africa, but never got to Western Africa or The Gambia. I look forward now to reading the Roots and planning a trip to this regions. Beautifully written and lovely photographs! Thank you! That sounds like such a powerful experience. You recounted it so well - thank you for including so much history. Definitely hard to read at points, but important to know. Beautiful pictures! We had to watch Roots in high school, and I remember so many emotions coming up and lots of discussion that's for sure! Oh wow. Thank you so much for sharing this. The poverty is just so saddening. Interesting post. I haven't seen Roots since the seventies when I was a little girl. How awesome that they do a Roots cruise. I had no idea!!! Looks like the trip of a lifetime and I LOVE the pictures. Thanks for enlightening me about this subject! I'm definitely going to have to pick up the book! This was fascinating! What a cool trip! Awesome photos. I'm probably one of the only people in America who hasn't seen Roots -- I'll need to remedy that. Wow...that is interesting. A Roots cruise...as I said, interesting. I remember seeing Roots, or part of it, on tv. I didn't realize it was based in The Gambia. Was that the movie that helped launch Oprah's career? I've read the books and also saw it on TV. It had a huge impact on me and my way of seeing many things in life. The tour sounds like an amazing experience! What a life changing experience this would be. It for sure could be a heart changing moment. I saw Roots as a kid. I want to read the book- it's on my Christmas list. Such a beautiful place. So sad that there is so much poverty. I'm sure GMT and lack of knowledge of the area stops many tourists from visiting. Your photographs are simply beautiful. It's so hard to comprehend living a world so different than what we have come to know here in America. Wow. You are living such an empowering life! I am speechless. Thank you so much for this post. I can read this over and over again. The pictures are amazing too. You have been doing some serious adventuring lately.